It was so nearly a perfect weekend for Matangi’s Samantha Felton who scooped a win and two placings with her horses but fell in the water on the fourth one. In the Honda International 3 star competition Sam took the title on Ricker Ridge Divine Right with a rise through the field over the three phases. Their dressage placed them 8th of the 13 starters but being the only pair to complete the cross country without time faults took them to the top of the leaderboard. In Sundays show jumping they had three rails in hand after second placed Maddison Crowe incurred 8 penalties for two fences down, but Sam only needed one and took the win with Maddy second. It was a first time win for Sam in the iconic event which has been running now for 18 years on the Puhinui Reserve. Sam had earlier jumped a clear round on her second horse Ricker Ridge Rui who finished third. In the 2* class Sam finished second on Ricker Ridge Riley who lead after the dressage but 4.4 cross country time faults cost the pair another win. Heavy rain in Auckland in the days before the event ran has caused difficulty for competitors on the cross country course, which proved deep and boggy in parts. Both the show jumping and the 3* dressage were moved to other parts of the Puhinui Reserve to try and find some better going for the horses. “I way exceeded expectations for the weekend having three in the top three – I came here with 4 horses and thought they all had a chance to be in the top 6! The first one, Ricker Ridge Sooty, who was lying second in the 2* class, jumped in well to the water jump then tripped and went right under and tipped me to the side. I was submerged and had to make a quick change from wet clothes to the next ride” said Sam. 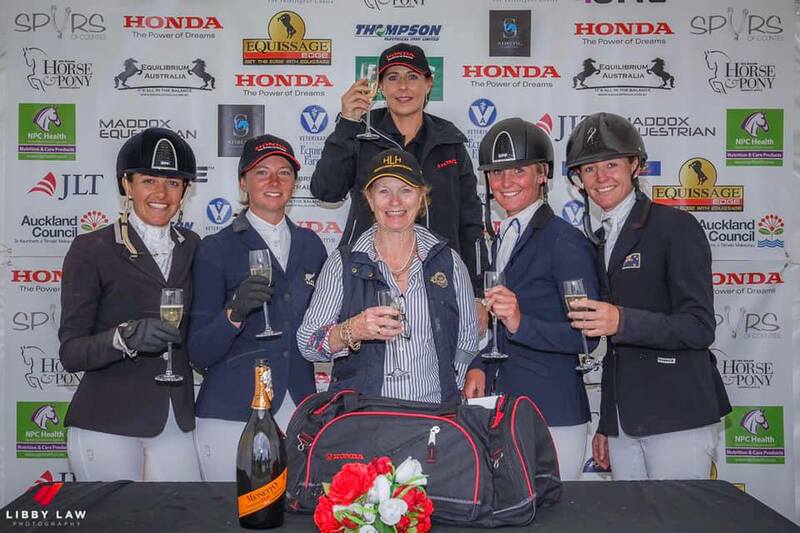 Her team also won the grooms award for the 3* class – shared by Georgina Walker and Andina Bailey who look after all Sam’s horses. This major win sets her up well for taking the plunge to possibly take several horses to try her hand in the home of eventing, England, next year. And having just got engaged there’s the small matter of a wedding to fit in during 2019. Second place in the 3* went to Madison Crowe and the relative newcomer Waitangi Pinterest. They beat more seasoned horses as this was horse and rider’s first three star long format event. After leading the dressage their 10.8 time faults across the country dropped them to second. They needed to jump clear to put pressure on the leader but perhaps tiredness crept in as the mare dropped two rails but hung on to their second placing. The 2 star class was won by Abbey Lawrence and Anonymous who rose from third after the dressage to take the lead and added no further penalties to win. Sam held second and the ultra-consistent Monica Oakley, who has had an outstanding spring season with her 5 horse team, took third with Acrobat. She also took second and fifth in the 1 star class with Festival and Artist. The 1 star class winner was Amanda ‘Muzi’ Pottinger who sat in second going into the show jumping where a clear round helped them take the win. Leader after the dressage Christchurch’s Emily Cammock run of bad luck continued with her single rail down in the show jumping dropping her from first to 6th. Emily also had the misfortune to have her well placed ride in the 3 star fail the final morning’s veterinary inspection. Third in the 1star class was Christen Lane with Henton Armada who finished on their dressage score of 33.4.